I heart the Korg Volca range! If you don't know them already then, chances are you never will, however - they are a set of self-contained, affordable and (mostly) analog synth/sequencer modules. There is a drum machine, 303-ish bassline synth, and a versatile 3-voice synth (they tease us with a currently unavailable sampler unit too). I love 'em .... but this isn't a review of them so Google as required..! Anyway, if you have Volcas you'll need some kind of mixer to combine their audio output for your listening pleasure, Even if you do have one (and I do own a Mackie mini mixer) the spontaneous mini-scratchpad style of the Volca's really needs something simple and lightweight that does not take a lot of setting up, so I decided to make my own passive mini mixer that I could keep set up with my Volcas. I keep my Volcas set up on a guitar pedalboard case so I wanted something I can keep, ready to roll, in there too. 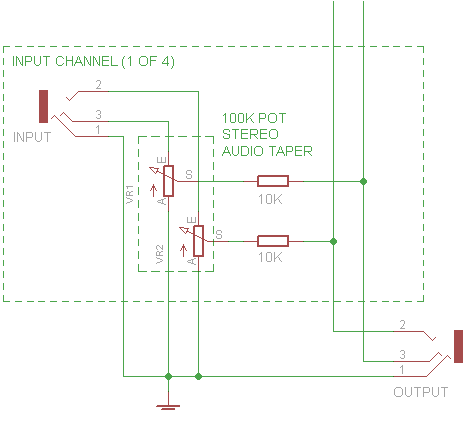 A simple passive mixer would do trick (i.e. just a bunch of sockets and resistors with no power needed) and a Hammond diecast aluminium stompbox enclosure would fit nicely in my setup. Love the project! Where did you source the two layer laminate? That is an awesome way to do graphics, so simple! Thanks - I got the laminate from ebay seller buzzastral_2005. Hi...for make 6ch mini passive mixer are necessari change resistor value?? It looks (and probably sounds) great! Please explain how you etched the design on the enclosure. Wow. Is that a personal (as in affordable) laser cutter? Where do I find this special laminate?